(Nanowerk News) Potential solutions to big problems continue to arise from research that is revealing how materials behave at the smallest scales. Research led by Arizona State University materials science and engineering professor Karl Sieradzki is uncovering new knowledge about the causes of stress-corrosion cracking in alloys used in pipelines for transporting water, natural gas and fossil fuels -- as well as for components used in nuclear power generating stations and the framework of aircraft. Sieradzki is on the faculty of the School for Engineering of Matter, Transport and Energy, one of ASU's Ira A. Fulton Schools of Engineering. His research team's findings are detailed in an advance online publication on June 22 of the paper "Potential-dependent dynamic fracture of nanoporous gold" on the website of the journal Nature Materials ("Potential-dependent dynamic fracture of nanoporous gold"). 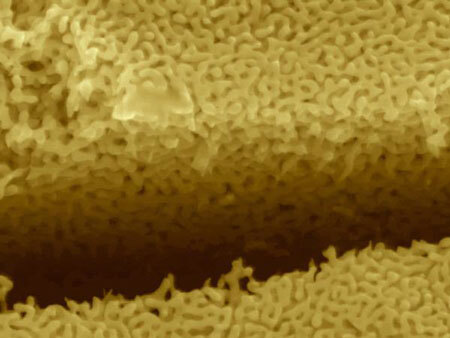 In the absence of a corrosive environment these gold alloys fail in the same manner as children's modeling clay, Sieradzki explained: Roll modeling clay into a cylindrical shape and you can stretch it by a by 100 percent before it slowly tears apart. In the presence of corrosive environments, silver is selectively dissolved from the alloy causing porosity to form (see photo). If this occurs while the alloy is stressed, then the material fails as if it were made of glass. The team's discoveries could provide a guide for "designing alloys with different microstructures so that the materials are resistant to this type of cracking," Sieradzki said.